This review uses only a four-star overall rating, rather than our traditional scale. The change will be explained in an upcoming post. This holiday season is fraught with sequels. With all of the twos and threes being thrown around, you might think that originality in video games is dead. Not so. And most surprisingly, this call to arms for cutting-edge game designers comes not from a small, independent studio, but from Electronic Arts, once giants of the industry known for their own sequel-touting ways. 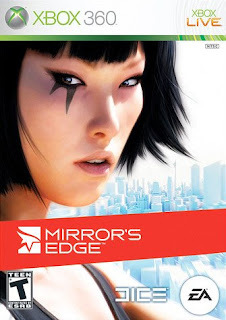 Mirror's Edge, published by EA and developed by DICE, is one of the most ground-breaking triple-A titles in years, and is worthy of competition even with 2007's award-winning Portal. Faith is a "Runner," a courier who transports goods and information in a city where government controls all communication. Runners' clients include criminals, rebels, and anybody else who the totalitarian government finds to be objectionable. When her "good cop" sister Kate is framed for murder, Faith finds herself knee-deep in a city-wide conspiracy that weaves in friends and foes alike. To escape armed police and S.W.A.T. teams after her very life, Faith (who is played entirely in first-person) must jump and run from rooftop to rooftop, using special parkour moves like vaulting, sliding, and wall-running to reach her targets. Mirror's Edge doesn't fool around when it comes to the primary gameplay mechanic. This game knows full well that it is about running, and as such, it provides a smooth, phenomenally entertaining mechanic to simulate that running. The longer that Faith moves in a generally straight line, the more momentum, and hence speed, she builds up. Momentum is like a realistic version of a "special move" bar, as having more of it allows for bigger jumps, higher wall-climbs, and quicker movements. For example, when climbing a fence, there are around a half-dozen different ways of climbing it, based on when you react and how much momentum you have. How you react to a fence (or similar obstacle) is actually the most important part of the game. Instead of the hold-the-"do stuff"-button strategy of similar games like Assassin's Creed, Mirror's Edge uses context sensitive buttons, mapped to the Right Trigger and Right Bumper, to create movements. When Faith reaches an obstacle, she can either press the "up" button (RB) to jump, vault, or climb, or the "down" button (RT) to slide under it. Combining these button presses allows her to do things like jump, curl over a barbed wire fence, and hit the ground in an action roll. Faith can also use a special ability if enough momentum is built up, allowing her to slow time temporarily and increase accuracy in jumps and combat. Like most games of its caliber, Mirror's Edge needs to be played to be believed. Thanks to great animations and a camera placed in Faith's eyes (rather than her chest), the game turns everything into a natural, smooth movement. This effect is so great that players will punish themselves for losing momentum or missing a big jump, creating a very self-motivated atmosphere. The style of the game rewards players for great moves like action rolls, but it is rarely frustrating because the game never actively punishes you for things done wrong. It might not look like it at first glance, but Mirror's Edge actually runs on the Unreal Engine, just like Bioshock and Gears of War. The game is beautifully rendered, and made all the more amazing by the stark, whitewashed landscape of the city. There are splashes of color here and there, but in general the game manages to make stunning, realistic landscapes using a simple, effective palette. And for further immersion, DICE has not included a HUD of any kind in the single-player campaign. Damage is shown by tunnel-vision and screen desaturation, and even the blue reticule in the center of the screen can be turned off in the options. Despite its daring disregard for traditional gameplay, Mirror's Edge runs into problems when it tries to go back to normal gameplay conventions. Terrible animated cinematic sequences are littered throughout the game, so that when the final level's cutscenes are delivered entirely in-engine (to great effect), it leaves one asking, "Why didn't they do that the whole time?" More problematic, however, is the combat. Enemies always have their guns aimed at you (no joke! I tested it), and shoot without hesitation or reloading as soon as they see you. Once you get close enough, you can fight them by pressing the Right Trigger for punches, and combining this with jumps and slides. When their gun turns red, pressing Y will cause you to grab the enemy's weapon and knock them out, but most of the time the window of opportunity is so small that you will need to use Faith's slow time ability. The best thing for players to do is to avoid combat at all costs, relying on the game's fantastic parkour mechanics to get them through hard times. Since the game is made to be played without shooting, this actually makes it far more fun. Sometimes Mirror's Edge might feel like a bad purchase for its somewhat steep $60 price point. Regardless, players who complete the game with the right free-flowing, pacifistic mindset will find that it is an incredibly rewarding experience. Not only that, but there are Time Trials and Speed Runs (connected to EA's leaderboards) that will provide endless entertainment for the perfectionists and competitive spirits out there. Playing Mirror's Edge like a first-person shooter is simply not fun, but investing yourself in the experience, running forward with all of your heart, and having a little Faith in the people at DICE makes this one of the most fascinating (and fun) games of the year. Mirror's Edge reflects how we tend to play games, and challenges us to try a new approach. A good mirror can do that.